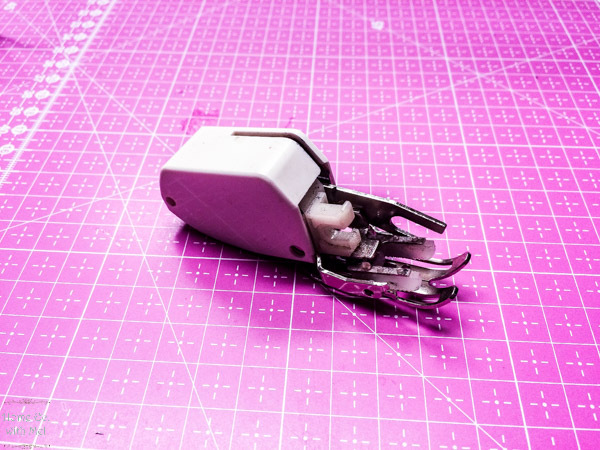 Hello everyone today we are going to discuss a few of the basic sewing machine feet that we frequently use while quilting. I am not going to begin to try to explain all the different feet available for sewing special purpose seams for the fashion enthusiast. My reasoning for this choice is simple, I don’t know how to use them or I am not proficient with using them. For this very reason, we are going to stick with the basic Straight, Zigzag, Walking, Darning, Hopping, and Roller feet. As a quilter, I haven’t run across a situation yet that couldn’t be solved by using one of these six feet. 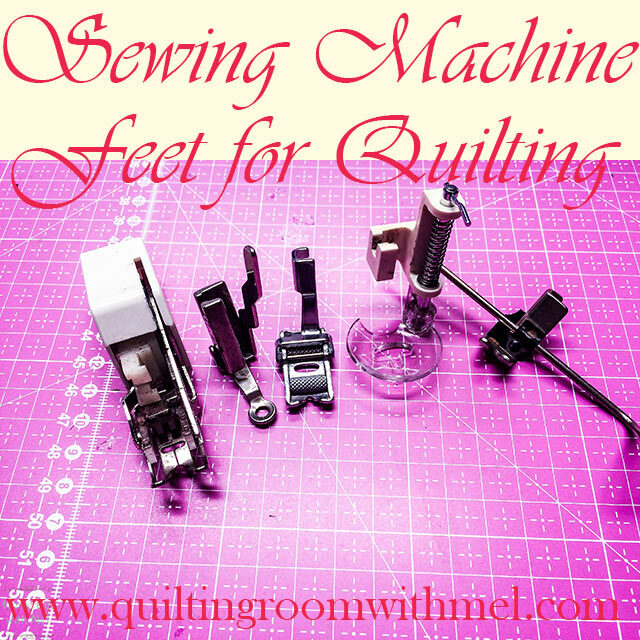 When I say I use these 6 types of feet to solve different quilting problems I am not saying that a person must have each of these to be able to quilt. 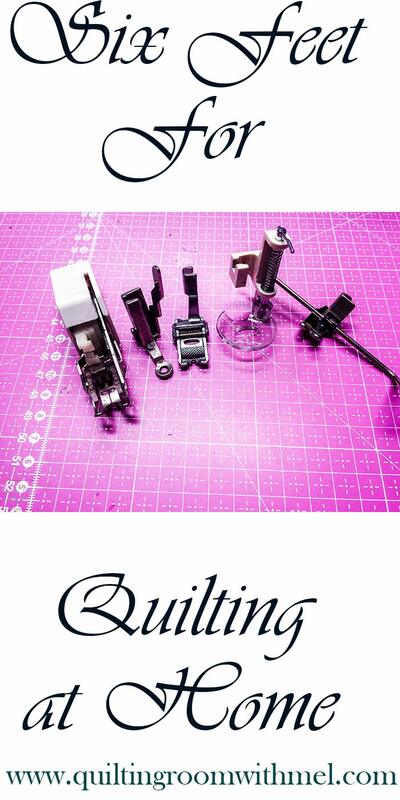 But I am suggesting that as quilters we should be open minded enough to realize the advantages to be had when we have these feet at our disposal. When we talk about quilting we are generally sewing small pieces of cotton fabric together to create a large piece of fabric which is used to cover a layer or two of batting which is in turn placed on a second large piece of fabric which serves as the bottom of the quilt, thus creating what is lovingly known as a quilt sandwich. Since the first step in our sandwich is the top and traditionally it was made by sewing smaller pieces together it naturally became known as piecing. Piecing is done using a straight stitch foot or a zigzag foot also known as a universal foot. The difference between a straight stitch foot and a universal foot is straight stitch feet have a hole in the foot slightly bigger than the needle in which to pass through as it makes a stitch. Or it has a narrow parallel slot splitting the foot into the so-called toes of the foot we are familiar with. A ZZ or universal foot has a perpendicular slot in which the needle can pierce through the fabric on either side of the central axis of the seam creating a zigzag stitch. Universal feet work quite well for sewing a common straight-line seam as long as the fabric is heavy enough not to pucker and surge as the needle goes thru the fabric. If the fabric is light enough and tightly woven it will flex up and down as the needle goes thru and it can be severe enough to cause missed or skipped stitches. When this situation arises a straight stitch foot will stop the lifting because it holds the fabric down on all sides of the needle. 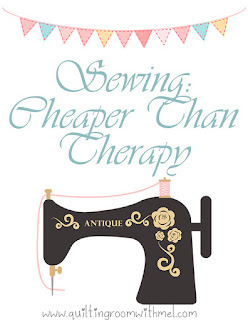 It may also be necessary to change the stitch plate to a straight stitch plate which serves the same functions and design as the foot but on the underside of the fabric to keep the fabric from pushing down with the needle stroke. So it is common to see the Universal foot and plate combination being used to sew straight stitch seams without any negative consequences. Once we have our sandwich made and pinned together we are ready to start quilting our sandwich together. Depending on the desired style of quilting we may not need to change from the foot we used for piecing. We can usually stitch in the ditch (follow our seams created during piecing) or we can straight-line quilt across the sandwich usually on a gridline diagonal without much hassle. The biggest problem comes when the top and bottom of the sandwich do not feed through at the same speed. Causing waves and wrinkles as the length of the seam increases. When faced with this set of circumstances we may be able to loosen our feed dog pressure and match the stretch caused by the feed dogs by pulling our fabric sandwich thru at the same speed the feed dogs are pushing causing the top and bottom of the sandwich to move at the same speed. Not exactly the easiest technique but it was only our ancestors had at their disposal during the infancy of the sewing machine. Eventually, history shows us the invention of the walking foot machines as we commonly refer to them as. (Low Shank, High Shank, Slant Shank, Kenmore Super High Shank) This helped in some aspects but the early walking foot machines still only moved the fabric from one side of the sandwich. 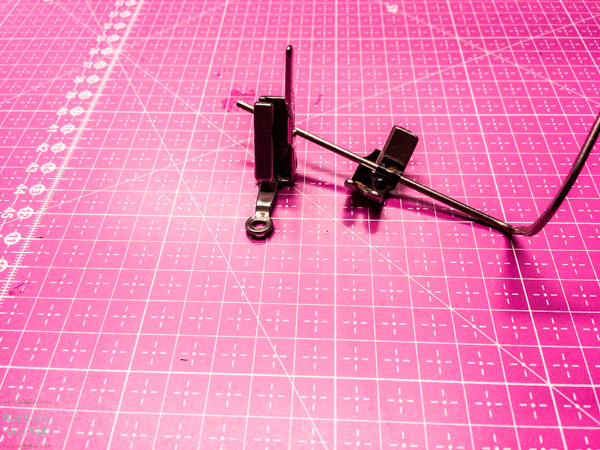 Shortly afterward innovation and persistence paid off with the invention of a foot that mounted to the presser bar and an arm that rides on the needle set screw and operates a set of teeth on the foot so the fabric is pulled from the top by the foot and from the bottom by the feed dogs. These feet called walking feet made the straight line quilting much easier. They also incorporated an adjustable guide bar so the rows of stitches remained evenly spaced. They can be used on a slight curve but don’t work too well on tight curves. They can be used turn 90 deg angles just like any other foot. The one thing they cannot do is reverse. By design there is no way to make the upper teeth reverse when the lower teeth do so reverse is out of the question. These feet do not have a way to adjust the speed of the teeth so the lower teeth or feed dogs need to be set so they match the stitch length with the speed of the upper teeth. Other than those discrepancies the walking foot had revolutionized the ease of straight line stitches on fabric that was hard to grip and feed reliably with only one set of teeth. During this same time period, we were also learning how to use a darning foot to patch holes in clothing. Being of a creative and curious species soon enabled our ancestors to realize that not only could they patch holes in fabric by sewing across the open spaces and sliding the foot along until they actually built a fabric where there was none, they also learned they could embroidery with the same foot. As they learned how to stitch pictures and shapes to be filled in they also discovered they could quilt shapes into their sandwich by dropping the feed dogs and allowing the foot to slide over the fabric. Just as in the advances of the walking feet the darning foot soon followed and the lever that actuates the upper feed teeth on our walking foot now instead lifts the darning foot off of the fabric momentarily between stitches and allows the fabric to be moved easily between needle strokes. This was the beginning phase of free motion quilting and put an end to the need to hand stipple areas on the quilt sandwich in order to gain dimension and depth. This allows the artistic touches into the quilt with the use of a machine. But as soon as the darning feet were being used in this manner it was soon discovered that they were limited in the ability to lift high enough from thick fabric sandwiches and a new style foot was soon to hit the market with a vengeance. Enter into the picture now the foot specially designed to handle free motion quilting, the hopping foot. 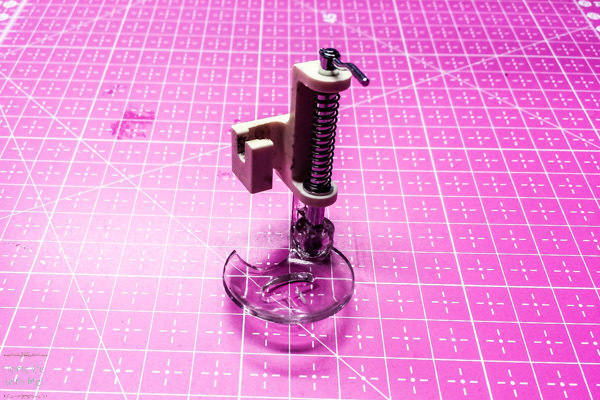 (Low Shank, High Shank) It incorporates the same basic arm from the needle screw to lift the foot but now instead it lifts straight up against a spring which allows for a higher lift between stitches. The higher lift makes it possible to free motion on a quilt sandwich that is thicker and fuller than was possible with a darning foot. It inherently makes it much easier to move the fabric in any direction and the lower feed dogs do not have to be dropped. 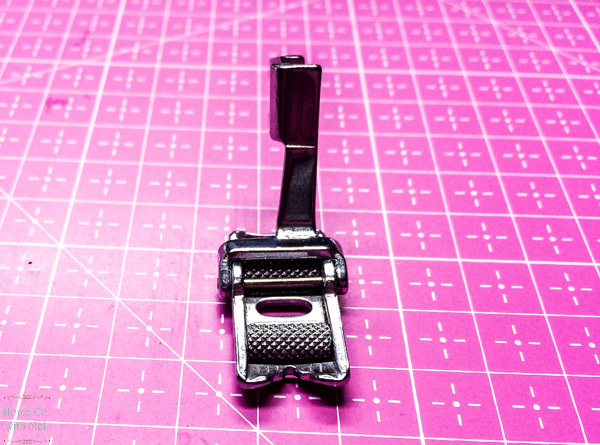 This just about covers all the feet that a vintage sewing machine user can use to manage fabric. The last foot to be mentioned is the roller foot. (Low Shank, High Shank) It is as simple in design as its name suggests. It replaces a regular foot with the skid plate and toes with a carriage that contains two rollers. One in the front and one in the rear of the foot. It maintains constant pressure like a standard foot but instead of sliding over the material causing friction and drag it uses the rollers to reduce the drag and let the fabric feed easier. The roller foot works very well when using a slick or slippery fabric and it also works well when putting binding around the edge of our finished quilt. I also like to use it sometimes when topstitching very close to the edge of the fabric. If you have found this post helpful sign up for our newsletter so you never miss out on our posts. As a thank you for signing up you'll get this great printable to decorate your sewing room. Like I said at the beginning of the post, It isn’t necessary to have all these feet but if you find them at your disposal they can sure make things easier. Until next time as always end your day with a smile, enjoy your machines your way and may your needle never come down while you are changing the bobbin.